Get you frequent fort questions answered! I’m fort-Bot, the customer service bot here to answer your questions. Q: What is the age range of Fort Boards®? A: While Fort Boards® is safe for all ages to play in, kids 5 and up love building with Fort Boards®. Does your child (or your spouse) like playing with Legos? Then they’ll love playing with Fort Boards®; it’s kind of like shrinking yourself down and playing in your Lego creations...except the other way around. The older your child (or man-child) is, the more elaborate things they can build! 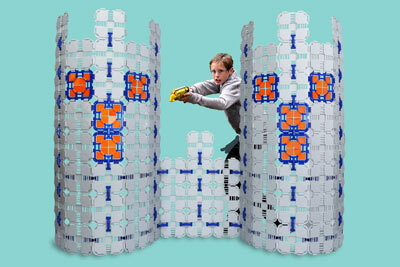 Q: I plan on making some of the biggest, baddest forts around. Just how safe are the parts? ... not that I'm scared. A: As a robot, I’m pretty detail oriented which makes Fort Boards® one of the safest building toys on the market. With these BIG building pieces there are no choking hazards. Our non-toxic plastics are tested to the highest standards. The boards are designed to safely and simply pop apart if climbed on, instead of cracking or shattering. So, you can build bigger and badder with Fort Boards® and not be scared... not that you are. Q: Can Fort Boards® be used outside? A: Yes! But don’t leave them out all winter and then accidentally run them over the next Spring with a riding lawn mower. Not that I’ve done that exact thing. But they’re great for building water fight bunkers and custom lawn games like corn hole. But don’t let me tell you what to do with your Fort Boards®; what can you come up with? Q: What's the difference between a Custom Fort Builder pack and a Custom Fort Builder Starter Pack? A: Starter Packs have 22 Board parts and can build anything you see here, such as castle towers, cockpits, and tunnels. Custom Fort Builder packs have 44 Board parts so they can build twice as big and will make houses, cars, airplanes and spaceships. But that’s only what I’ve figured out; you’re probably far more creative than a robot. A: Yes, you can order internationally through Amazon. Sit down before looking at the shipping price that they’ll charge you… it’s a lot. Click here to order (but remember, sit down first). Q: My child has special needs. Are Fort Boards® a good building toy for them? Q: I lost a piece. How do I get a replacement? Q: I just built something super-duper awesomely amazing. Want to see it? How do I show it off, without seeming like I'm showing off? A: Don't be modest, we’d love to see it! Heck, your fort could just be mildly-duper and we’d still love to check out what you’ve been building. Shoot us a message at info@fortboards.com or or tag your photos with #FortBoards on social media. Q: Would Fort Boards® be good for schools, libraries, or museums? A: Absolutely! There are already many schools that are using Fort Boards® to actively teach STEM lessons and many use them as a fun toy that can passively impart lessons of engineering and math. More and more libraries are including "Maker Spaces" and using Fort Boards® there too! We also have had ongoing relationships with children's museums across the country and have had interactive fort building exhibits showcased as well as building and construction exhibits. Q: What is the best building toy for kids? A: Fort Boards® is the best building toy! And I assure you, I'm 100% unbiased. Curious about Returns, Refunds & Warranties? Head over to our Returns & Refunds Policy page. Got a question that wasn't answered? Contact Us at our Contact Us page.